The great thing about the summer season is the ability to hide comfort food in 'summer-dish' format. This was the case at the last dinner at my parent's house. We very rarely have dessert at my own house, but when we're visiting others, especially my parents, it seems to be expected. The dessert course is usually something simple and store bought such as pie. It's tasty and easy, but a person can get bored with it pretty quickly. I took it upon myself to make something new and exciting that would bring a new dimension to the table. My dad asked for jello but that wasn't good enough in my opinion. Jello is fine, but I was looking for something with more substance. I was sitting at my computer the night before we were going to my parent's house when I got the idea for the cobbler. 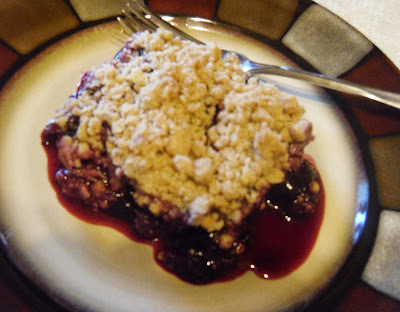 I had never made one before so I thought it was the perfect opportunity to take advantage of all the summer berries and work on my dessert skills. I don't normally make desserts so I like to take on the challenge when possible. The finished product was juicy with just the right amount of sweetness and crunch. I think I can safely add it to the awesome category. Oh, and I did end up making the jello for my dad. Of course, it couldn't be just jello though - I had to create a three layered spectacular with fruit and cool whip and hours of preparation. Yep, even jello deserves the gourmet treatment sometimes. 1. Mix berries, lemon juice and sugar and spread in 13x9 inch pan. 2. 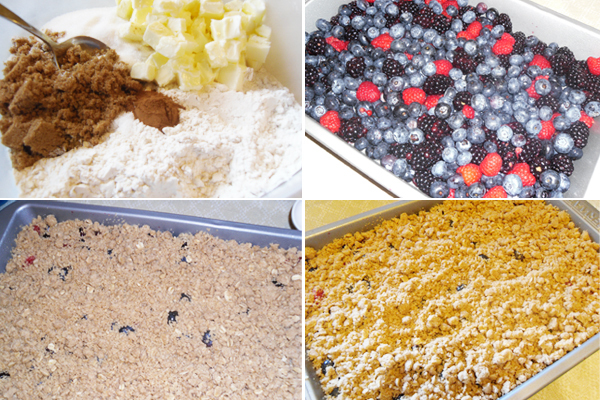 Mix all crumb toppings together until a crumb consistency is formed. 3. Evenly sprinkle crumb topping over berries. 4. Place in oven, uncovered, and bake for 30 - 40 minutes until bubbly and crumb topping is lightly browned. Pizza for Breakfast? You Betcha!